Josh Peckler - Jpeckler@shawmedia.com The Chicago Bears' Matt Forte celebrates scoring a touchdown in the second quarter against the Indianapolis Colts at Soldier Field Sunday, September 9, 2012. 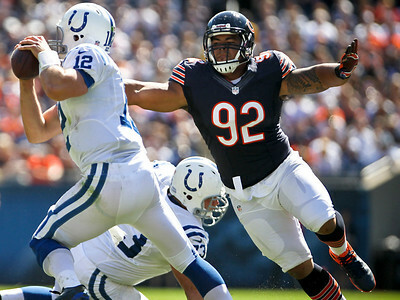 The Bears defeated the Colt 41- 21 in the season opener in Chicago. Josh Peckler - Jpeckler@shawmedia.com The Chicago Bears' Matt Spaeth (92) chases down Indianapolis quarterback Andrew Luck during the third quarter at Soldier Field Sunday, September 9, 2012. 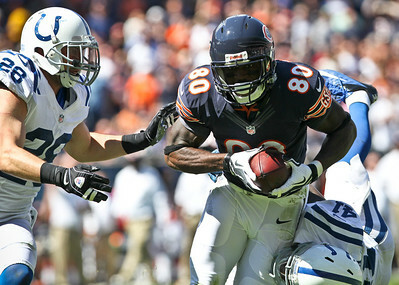 The Bears defeated the Colts 41- 21 in the season opener in Chicago. Josh Peckler - Jpeckler@shawmedia.com The Chicago Bears' Brandon Marshall goes airborne to catch a pass in next to Indianapolis's Antoine Bethea (41) after receiving a pass in the second quarter at Soldier Field Sunday, September 9, 2012. 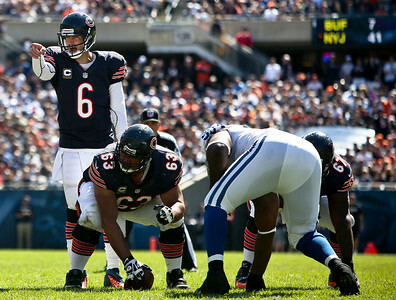 The Bears defeated the Colts 41- 21 in the season opener in Chicago. 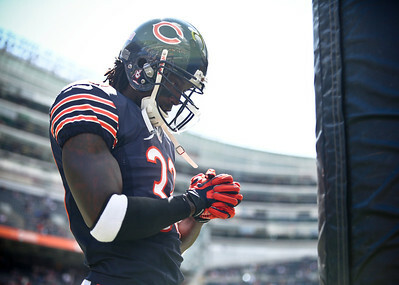 Josh Peckler - Jpeckler@shawmedia.com The Chicago Bears' Charles Tillman says a prayer prior to their game with the Indianapolis Colts at Soldier Field Sunday, September 9, 2012. The Bears defeated the Colts 41- 21 in the season opener in Chicago. Josh Peckler - Jpeckler@shawmedia.com The Chicago Bears' Matt Forte shrugs off Indianapolis' Vontae Davis during the first quarter at Soldier Field Sunday, September 9, 2012. 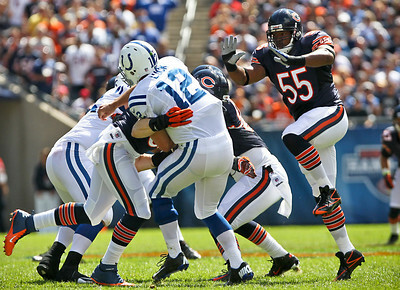 The Bears defeated the Colt 41- 21 in the season opener in Chicago. Josh Peckler - Jpeckler@shawmedia.com The Chicago Bears quarterback Jay Cutler points out a Indianapolis defender during the third quarter at Soldier Field Sunday, September 9, 2012. 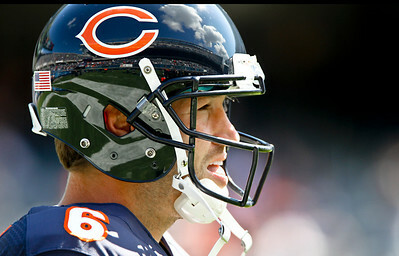 The Bears defeated the Colt 41- 21 in the season opener in Chicago. Josh Peckler - Jpeckler@shawmedia.com The Chicago Bears' Alshon Jeffery runs towards the end zone being chased by the Colt's Vontae Davis during the third quarter at Soldier Field Sunday, September 9, 2012. 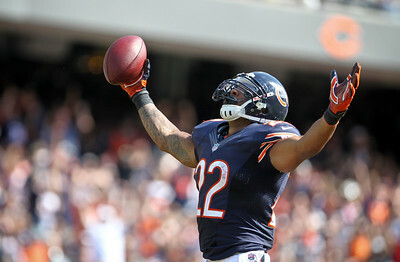 The Bears defeated the Colt 41- 21 in the season opener in Chicago. Josh Peckler - Jpeckler@shawmedia.com The Chicago Bears' Devin Hester brakes away from the Indianapolis Colt's Sergio Brown during the third quarter at Soldier Field Sunday, September 9, 2012. 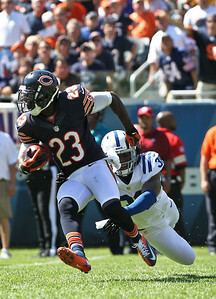 The Bears defeated the Colts 41- 21 in the season opener in Chicago. 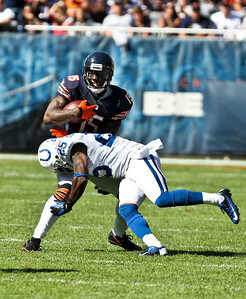 Josh Peckler - Jpeckler@shawmedia.com The Chicago Bears' Brandon Marshall (15) gets hit by the Indianapolis Colt's Jerraud Powers after receiving a pass in the forth quarter at Soldier Field Sunday, September 9, 2012. 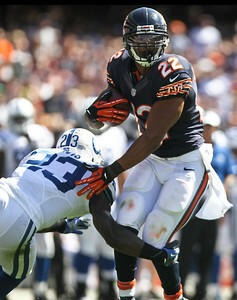 The Bears defeated the Colts 41- 21 in the season opener in Chicago. 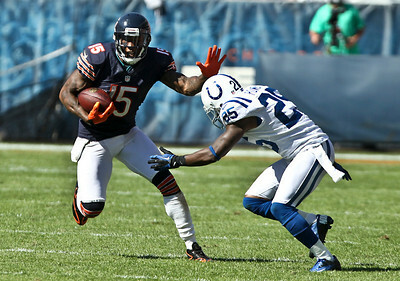 Josh Peckler - Jpeckler@shawmedia.com The Chicago Bears' Brandon Marshall (15) attempts to stiff arms the Indianapolis Colt's Jerraud Powers after receiving a pass in the forth quarter at Soldier Field Sunday, September 9, 2012. 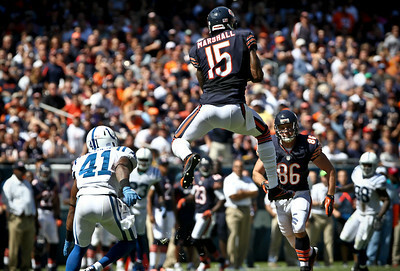 The Bears defeated the Colts 41- 21 in the season opener in Chicago. 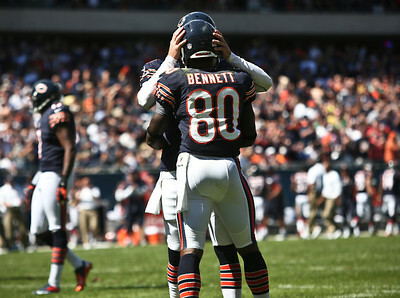 Josh Peckler - Jpeckler@shawmedia.com The Chicago Bears Earl Bennett (80) gets a congratulation from quarterback Jay Cutler after almost scoring a touchdown during the third quarter at Soldier Field Sunday, September 9, 2012. The Bears defeated the Colts 41- 21 in the season opener in Chicago. 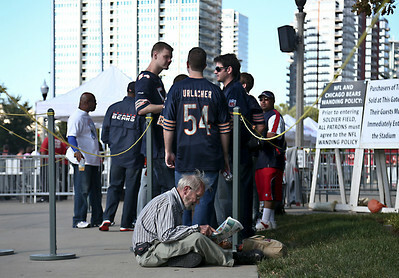 Josh Peckler - Jpeckler@shawmedia.com A man reads a newspaper while waiting in line to enter Soldier Field before the Bears took on the Indianapolis Colts Sunday, September 9, 2012. The Bears defeated the Colts 41- 21 in the season opener in Chicago. Josh Peckler - Jpeckler@shawmedia.com The Chicago Bears' Earl Bennett tries to break through Indianapolis defenders Tom Zbikowski (28) and Antoine Bethea (41) after receiving a pass in the forth quarter at Soldier Field Sunday, September 9, 2012. The Bears defeated the Colts 41- 21 in the season opener in Chicago. Josh Peckler - Jpeckler@shawmedia.com Indianapolis Colts quarterback Andrew Luck pitches the ball back to Donald Brown during the second quarter at Soldier Field Sunday, September 9, 2012. The Bears defeated the Colts 41- 21 in the season opener in Chicago. Josh Peckler - Jpeckler@shawmedia.com Chicago Bears' quarterback Jay Cutler watches the defense from the sidelines during the forth quarter at Soldier Field Sunday, September 9, 2012 against the Indianapolis Colts. The Bears defeated the Colts 41- 21 in the season opener in Chicago. Josh Peckler - Jpeckler@shawmedia.com The Chicago Bears' Lance Briggs (55) jumps up as he prepares to help sack Indianapolis quarterback Andrew Luck during third quarter at Soldier Field Sunday, September 9, 2012. The Bears defeated the Colts 41- 21 in the season opener in Chicago. 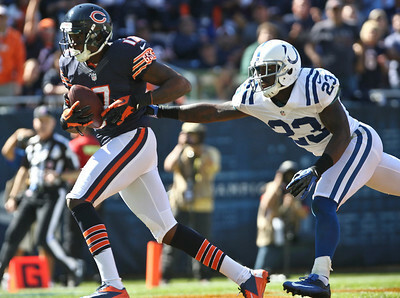 The Chicago Bears' Alshon Jeffery runs towards the end zone being chased by the Colt's Vontae Davis during the third quarter at Soldier Field Sunday, September 9, 2012. 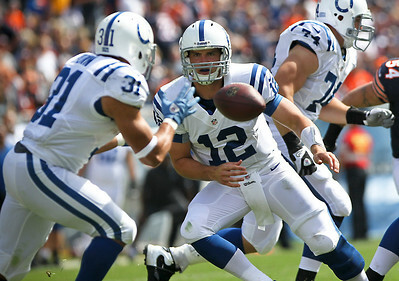 The Bears defeated the Colt 41- 21 in the season opener in Chicago.